SAVE $100 ON YOUR NEXT FLOOR! 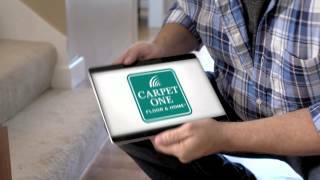 "Trust the experts at Kerns Carpet One to get it right the first time with a FREE in-home measure." Thank you for visiting Kerns Carpet One's Shop at Home page. We appreciate you considering us for flooring and believe the experience you'll receive in home will be comparable to how we treat you in the store. When filling out the information make sure the types of flooring is noted along with any other description or ideas you might have interest in i.e. frieze or hand-scraped hardwood flooring. This will help us better prepare for our visit. In addition, please provide us with some flexibility on date and time. Our goal is to get to you as quickly as possible, but in some cases due to our traffic load this might not be feasible. Please help us in making this experience a positive one. Remember, "You'll have NO concerns when BUYING from KERNS" - locally owned and operated since 1935. You’ve come to expect a high level of service at our showroom, but now we can bring you that same service with even more individualized attention in your home! We send the experts to your home with samples handpicked per your request and even preform and onsite measurement with a FREE estimate. Make sure you complete the form on this page to ensure our sales professionals know exactly what you’re looking for and to be able to assist you. Our volume of Shop At Home requests is high, so a flexible schedule is ideal for us to work with! Save on your next flooring purchase with our $100 coupon!